This Saturday April 15th, a very special festival will take place in Asakusa: the Yabusame festival. A not very known Japanese martial art, even among the Japanese themselves, Yabusame is a type of mounted archery that dates back to the beginning of the Kamakura period (1192 - 1333). Considered by some as a ritual rather than a sport for its religious aspect, it is only taught in two schools in Japan as of today. What is special about Yabusame? If Yabusame is not a very famous Japanese martial art, it certainly figures among the most spectacular ones, for it is very complex and requires a range of impressive skills. 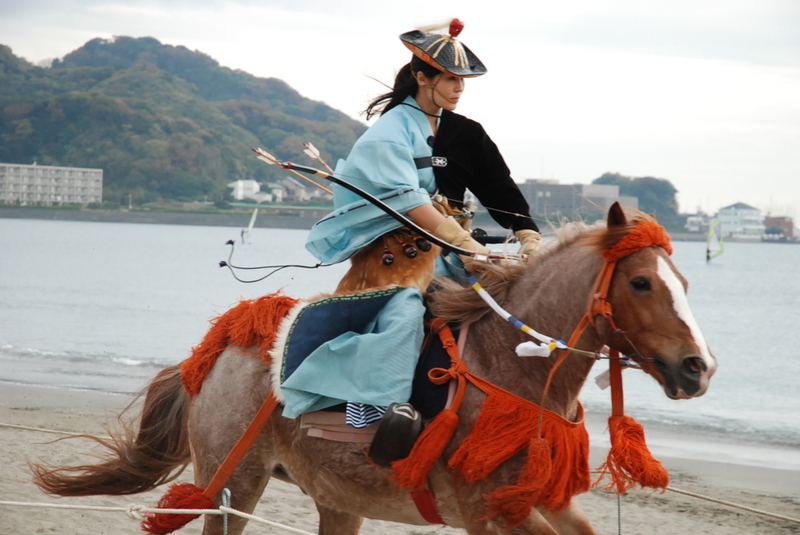 On a 255-metres track, Yabusame archers ride their horses at high speed, and have to shoot three arrows at three successive targets. This implies that they control their horse with only their knees, as their hands are holding the bow and arrow. The three targets are loaded with pink and white confettis beforehand so that when one of them is hit, it bursts in an explosion of what would easily be confused with cherry blossom petals. And if that wasn't enough, all the archers wear elaborate hunting costumes of the Kamakura period! If you are around Tokyo, there are three main location where Yabusame festivals take place, at different times of the year. Meiji Jingu Shrine holds an event every year on Culture day, which falls on November 3rd in Japan, while the Toyama Park's event, in Takadanobaba, takes place on the second Monday of October. But if you want to learn about and see more of the Japanese Culture, the best place to go is Sumida Park, whose Yabusame festival is every year on the third Saturday of April. After the festival, which lasts no more than a hour, you can cross the Azuma bridge back to Asakusa to have a glimpse of the ancient Tokyo: shop along Nakamise and admire the beautiful Kimono and Yukata worn by the visitors of the Sensoji temple. And as we are only 5 minutes away from the temple, why not visiting us? Try one of our three Japanese-themed game rooms for an hour of adventure in total immersion, and take some time after your game to reflect on a day rich in history and culture, over some snacks and tea.